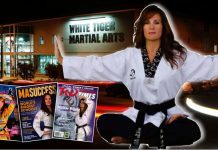 Devorah Yoshiko Dometrich began her study of Chito-ryu karatedo at the age of 14 under the instruction of her adopted father Kyoshi William J. Dometrich. 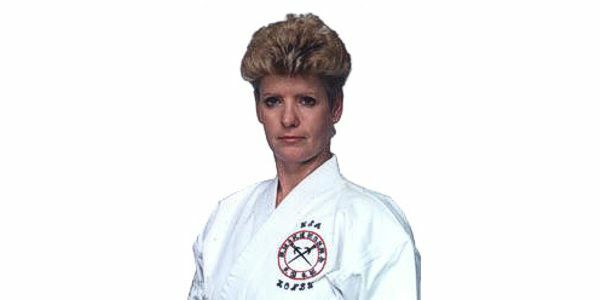 In 1966, Dometrich was the first women’s national karate champion in the history of the United States, in both Kumite and in Kata. She would regain this title eight years later at the United States Karatedo Federation’s national tournament. From 1972 to 1977, she served in the United States Air Force (USAF). In 1974,the Vietnam War and the USAF took Dometrich to Okinawa, Japan as part of the 376 Strategic Air Command. Here, she met Inomoto Masaru a fellow Chito-ryu karateka who introduced her to Akamine Eisuke Hanshi of Ryukyu Kobudo Hozon Shinkokai. During this fateful year, Dometrich would begin her study of Ryukyu Kobudo under the direct instruction of Akamine Sensei. In addition, she began the study of Muso Jikiden Eishin-ryu iaido under Inomoto Sensei’s direct instruction. From 1974 to 1977, Dometrich spent virtually all of her free time training with either Akamine Sensei or Inomoto Sensei. In 1976, Dometrich earned Grand Champion, Second Place at the First All Okinawan Kobudo Shiai sponsored by Akamine Sensei. 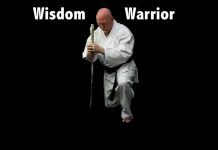 By early 1977, Dometrich was awarded the rank of sandan (third degree black belt) in Ryukyu Kobudo and shodan (first degree black belt) in Muso Jikiden Eishin-ryu iaido. On February 7, 1977, Dometrich was honorably discharged from the USAF and chose to remain in Okinawa to continue her studies for the maximum time permitted by her visa. That spring would prove eventful for Dometrich. Prior to her return to the United States, Dometrich received her Instructor’s Certificate in Ryukyu Kobudo and Akamine Sensei appointed her as head of Ryukyu Kobudo Hozon Shinkokai Beikoku So Honbu (United Stated Headquarters). Upon her return to the United States, Dometrich began a career as police officer. In addition to her regular patrol duties, she spent 13 years as a police instructor for the Justice Cabinet of Kentucky. Dometrich specialized in accident investigation, hostage negotiations, weaponless defense and firearms instruction (with NRA and FBI certifications). In 1979, she married Paul Herbst, a fellow police officer. Throughout her career, she diligently studied and taught kobudo, iaido and karatedo while maintaining regular contact with Akamine Sensei. From 1988 to 1998, Dometrich returned to Okinawa six times times to visit and learn from Akamine while training with her kyodai (brothers) at Akamine Sensei’s Shinbukan dojo. Each visit lasted three months, the maximum allowed by her visa. In 1995, she participated in the Taira Shinken Embu Taikai, commemorating the 25th anniversary of Taira Shinken’s Death. 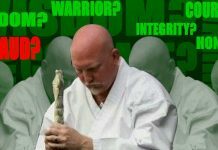 Dometrich retired from police work in 1996 to follow in the footsteps of Taira Shinken by traveling and teaching Ryukyu kobudo. In 1997, Akamine Sensei asked her to return to Okinawa to assist him in teaching kobudo at the first Okinawa Karate and Kobudo World Tournaments. This trip would prove to be particularly auspicious. During this visit Dometrich renewed ties with Shinzato Yoshihiko with whom she had trained at the Shinbukan in the 1970s. Now living and teaching in Lima, Peru; Shinzato is also a student of Onaga Yoshimitsu, teacher of Kobayashi Shorin-ryu karate and ti’, the art on which all karate was founded. Onaga was the senior student of Higa Yuchoku, himself a student of Chibana Chosin and friend to Taira Shinken. It was Higa whom Taira enlisted to bring gamanku (hip technique) to his kobudo. Intrigued by this connection to the lineage of Ryukyu kobudo, Dometrich asked Shinzato for an introduction to Onaga. Shortly after this introduction, Dometrich began her study of ti’ under Onaga’s direction. Also during this trip, Akamine awarded Dometrich the rank of kyoshi nanadan (seventh degree black belt). This was the first time such rank was ever conferred on a woman in karatedo or kobudo in Okinawan history. Before leaving Okinawa, she and Takara Sachi Yoshi assisted Akamine Sensei in resurrecting three lost kata – Chatan Yara no Kon, Yakaa no Sai, and Kyushaku Bo. On January 13, 1999 Akamine Eisuke Sensei passed away. Okinawa lost a living treasure and Dometrich lost a mentor and teacher. Immediately, she left for Okinawa a seventh time to attend his funeral, support his widow and help determine the future of Ryukyu Kobudo Hozon Shinkokai. During this trip, Onaga Sensei counseled her not to grieve, but to train and teach… as that would be Akamine Sensei’s wish for her. Today, that is precisely what she does. While she regularly conducts classes at the honbu dojo in Cincinnati, Ohio; any given week may find her teaching in one of any number of dojo across the United States and Canada. When she is not teaching, she can be found training at home in her dojo. Due to his unrelenting focus on technical excellence, Akamine had only fourteen committed deshi (students). Of those fourteen deshi, only a handful remain active. It is important to note Dometrich was Akamine Sensei’s only non-Okinawan, non-Japanese deshi and remains his most direct link outside of Japan or Okinawa. As she plays her part in preparing the next generation of kobudoka, Dometrich is as committed to preserving the legacy of Akamine Eisuke, as he was to his teacher, Shinken Taira.